Candidates would be looking for CAT 2017 - 2018: Admit Card, Exam Dates, Exam Pattern, Syllabus we have good news as soon notification for CAT 2017 - 2018 will be out. All the interested and eligible candidates can apply for the exams. For more data like syllabus, exam pattern, admit card, registration date checkout the below article. For any questions or queries kindly comment below in comments. 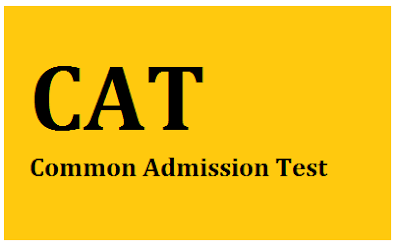 Common Admission Test (CAT 2017) is one of the competitive entrance examinations for pursuing postgraduate programmes in Business Administration. It is the gateway for admission to 19 Indian Institute of Management (IIMs) and various B-schools located across the country. This national level examination is conducted by the IIMs on the rotation basis. Every year a large number of candidates appear in the CAT examination and the number is increasing year by year. The candidates are informed to consider CAT 2018 for admission in the year 2017. This article familiarizes the candidate with all the necessary details and notifications about CAT 2018 & application form correction. As a huge number of candidates appear for CAT exams every year which has a large importance for getting a best college for Management courses. The candidates who are interested for CAT 2017 are required to apply online. CAT 2018 Registration is over now. Before applying for CAT 2017, check your eligibility by referring the eligibility document available on the official website of CAT 2017. The registrations was done till 27th September 2017. For payment purpose, net banking, credit card (Visa/Master/American Express)/ Debit card (Visa/Master) will be applicable. The general candidates/NC-OBC has to pay Rs. 1700 while the candidates of reserved community (SC)/ST will be charged Rs. 850. In addition to this payment, transaction processing fees will also be applicable separately. The minimum qualification required is bachelor’s degree with 50% marks (45% for SC/ST/PWD). If the obtained marks are in the form of CGPA then it would be converted to percentage marks based on the procedure certified by the university/ institution from where the candidate has passed his/her bachelor degree. The candidates appearing in the final year of bachelor’s degree and whose results are awaiting are also eligible to apply for CAT. It must be necessary for the candidates to have knowledge about the examination pattern that includes number of questions appear in the examination, number of sections, time duration, areas from where question paper will be made, etc. In this section we have provided the CAT 2018 exam pattern in detail. Type: Computer based test (CBT). Duration: The duration of the paper CAT 2018 exam will be of 180 minutes. No. of Questions: 100 Objective type questions. Syllabus Covered: logical reasoning & data interpretation, verbal ability & Reading Comprehension and quantitative ability. Marking Scheme: 3 marks for every correct answer. Time Limit per Section: Candidates will be allotted exactly 60 minutes for answering questions in each section. The CAT Syllabus divided into four sections: Quantitative Ability, Data Interpretation, Verbal Ability & Logical Reasoning. Candidates preparing for the CAT exam, must be aware of the CAT 2017 syllabus. The syllabus comprises of Quantitative Aptitude, Verbal and Reading Comprehension, Data Interpretation & Logical Reasoning. Candidates have to master these topics in order to score well in the exam. It is a computer based test which contains multiple choice questions (MCQ). Some of the question will be of subjective types. The result of the CAT 2017 will be declared in the second week of January, 2018 tentatively. The candidates can check their result through the official website of IIM CAT by providing their valid user ID and password. Also, the result intimation message will also be sent to the candidate’s registered phone number. The result contains the percentile marks as well as sectional and total marks obtained by the candidate. After the announcement of result, the cut-off marks will be released by the IIMs. The authority will announce the section-wise score card that contains all the details relevant to the performance of candidates in CAT 2017 exam. The candidates are able to access their score card on the same day of the result announcement. The score card of CAT will be valid for one year. The candidates have to login with their credentials to download the score card.